I am an absolute Baz Luhrman fan. In college, my dream wedding was a Baz Luhrman themed wedding, with elements from Moulin Rouge (Click related Rebellious Idea HERE), and Romeo and Juliet. 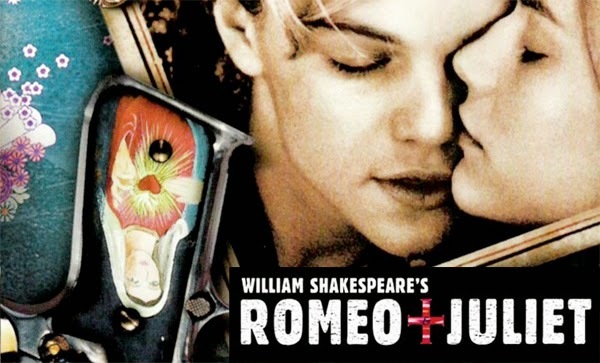 I loooooove Baz Luhrman's R+J version. My closest friends can attest to the fact, that my secret inspiration for my bridal gown since college is Juliet Capulet. Simple. But romantic. 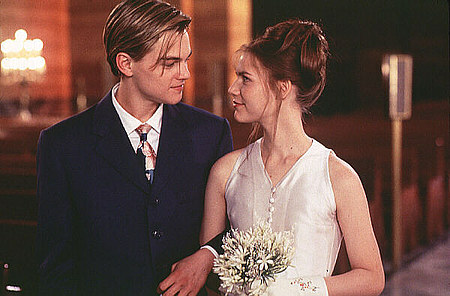 In fact, I once saw the perfect Juliet-inspired dress in Mango years and years ago and when I saw it, my heart skipped a beat. I wanted to buy it in that instant, for my future would-be gown. Buti nalang I didn't--for my size then is soooo different from my size now. But it has always been my secret inspiration. Are you "rebellious" enough to execute a VERY simple wedding ceremony, with only love in your sleeves? When R+J decided to have a secret wedding, they were so engrossed with their love that they opted for a simple ceremony...just "us", and just the wedding itself. Nowadays, keeping it "simple" for the ceremony is so unusual that it becomes a rebellious idea in itself. The simplicity of pure love. How wonderful is that? This time around, because of the theme, the perfect place to do the ceremony is actually in a church! And are you ready to do a little bit of role-playing for the reception? For the masquerade-inspired reception, we take the fashion a little bit more playful (but still very simple and romantic) with R+J's costumes in the party where they first laid eyes on each other. The bride as an angel, and the groom as a knight in shining armor. How lovely is that? Are you rebellious enough to allow the Boys of your entourage to be BAAAAD? This is a very awesome theme to have the boys really play with their looks. I am excited to see how the guys will get serious with this theme and really look the part. If you are rebellious enough, they can even carry toy guns! 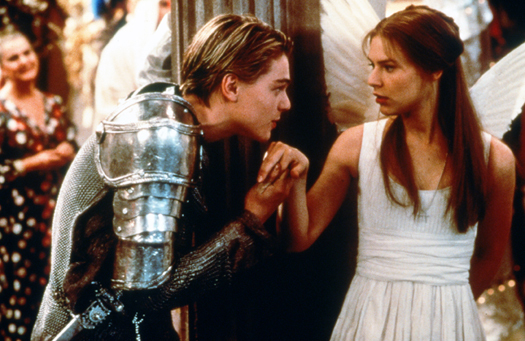 One of the most iconic pieces from the R+J movie is R+J's "I Love Thee" wedding rings. Again. One of my initial wedding pegs. Swoon! Baz Luhrman did a great job modernizing the masquerade ball from the original movie to how we would rock it today. How about a masquerade mask for your wedding invites, a crazy masquerade party as the reception, and aquariums everywhere? Better yet, how about doing the reception in Ocean Park!?! Baz Luhram sets his R+J movie in modern-day Verona. A little violent, a little grimy, but still beautiful. How rebellious would it be to actually set the mood of your reception with all of these ironies? "Did my heart love 'till now"
At the very heart of Romeo and Juliet, is the romantic, Shakespearean language. Have a friend create graphic layouts with all of your favorite lines placed on each table. 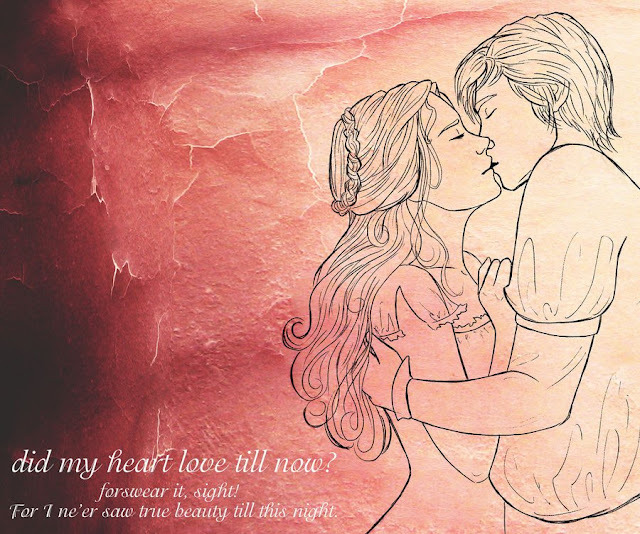 "Did my heart love 'till now...." is my favorite R+J quote. I literally still feel butterflies in my stomach when I recall the words and the movie scene in my head. Double Swoon. Another awesome element of Baz Luhrman's R+J version is the music. LOVE.....LOVE...L-O-V-E! The Bridal Walk - the default here would be "Kissing You". 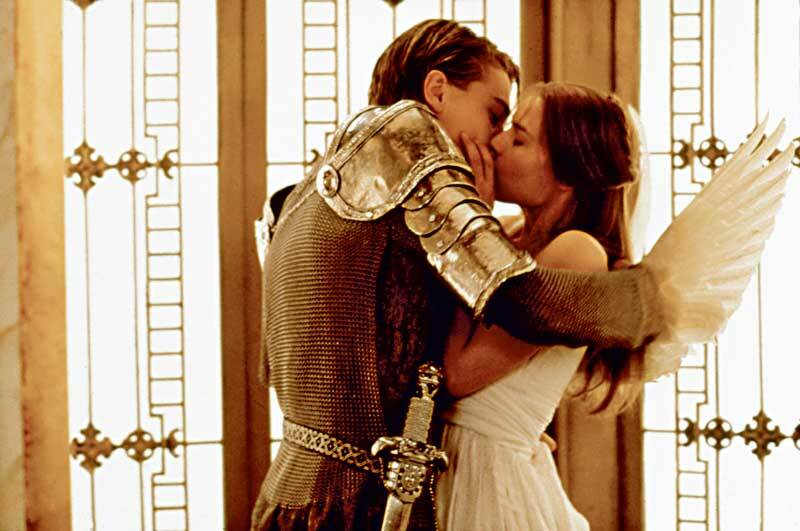 But I think it would actually be more dramatic, if you use the actual song that was playing when Juliet walked down the aisle, during their secret wedding. A SIDENOTE: When I searched for this in Youtube and watched it again, I wanted to cry. Awwww...one of the best scenes ever! The Prenup Video - props to the rebellious couple (and the rebellious videographer) who can pull this off! The Couple's Dance - of course an R+J wedding will never be complete without the song "Kissing You" so in my mind, this is the most romantic scene, perfect for the song. The Couple's Dance - w/ a TWIST - however, put a twist into the couple's dance by suddenly changing it to The Cardigans' Lovefool! The official R+J promo release music. The Boys, the Boys - If the groom and his friends are game enough to do this, this makes for a very cool entertainment rather than the usual song and dance number. So have your videographer do another video, but this time, just starring the Boys. The Drag Queen - Know any gay friends who would be willing to do this? How about a straight guy friend, drunk enough to do it? Or how about a girl friend na bading badingan? Time to signify that the party has started with this fun, dance number! damn this is a great idea for a wedding!